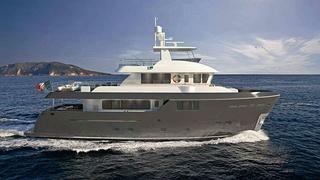 Italian shipyard Cantiere delle Marche (CdM) has signed the contract to build a new 26.1m Darwin Class 86 explorer yacht. News of this order comes months after CdM launched its new flagship, the Darwin 96 Stella di Mare, which will debut at the upcoming Festival de la Paisance in Cannes. Like her sisters, the new Darwin 86 is designed and engineered by Sergio Cutolo of Hydro Tec, featuring extra-thick steel plates, commercial-grade water-treatment systems and independent rudders as standard. Also in keeping with previous CdM yachts, she will feature a customised interior and technical specifications. Architect Pierluigi Floris, who styled the first two 86s, created the interior styling for the new hull, designed around the owner's collection of contemporary art. She will have a modern interior styling to suit, with free-standing contemporary furnishings and materials ranging from beige to grey, matching the gunmetal-grey hull paint. Owner requests for this build include a sophisticated security system, dehumidifier system, a transitioning swim platform and an opening hard top.